As a little girl, I dreamed of a canopy bed. Instead, I got a Danish modern bedroom of teak, rosewood, black leather, and red wool, in keeping with my parents' mid century modern home. Not exactly my dream room. 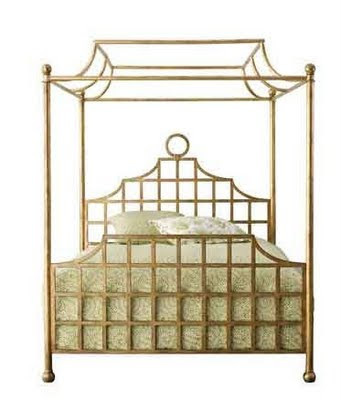 So today I will finally get my canopy bed when my wonderful gold leaf Annie Selke pagoda bed arrives. I am also in the process of redoing the Chinese Chippendale chair I posted about. Stay tuned for the big reveal next week. gorgeous!!! you must be so excited!! Cannot wait for more. I'd be standing at the curbside anxiously awaiting it's arrival. Simply stunning. Would of loved your childhood mid-century modern room as well, you lucky girl! Oh, the unspeakable joys of being a grownup getting a child's dream come true. I expect many lovely chinoiserie dreams will be dreamt here. Enjoy. lucky! i hope you enjoy the hell out of that beautiful bed for many, many nights to come! sweet dreams! The bed is absolutely beautiful! Can't wait to see the pictures!! Are you kidding! That is coming to your house! You are one lucky girl. It is simply stunning. Yes I hope there will be pictures. Enjoy. The is a gorgeous bed! Your site is killer too. I will be back. Adding you to my blogroll now. Really stunning and so inviting, you will have so much fun with this!! oh you must be thrilled to pieces! It is gorgeous!! Congratulations. Lauren-Thanks-it's all set up and it is gorgeous. Deb-Thanks-it's wonderful-much more my style than mid century modern. The Glam Lamb-It's going to be a great room. CC-I will definitely post pictures. Kitty-Thanks, I'm sure I will. Kit-Thanks-I think you'll like the room-it will have a French feel. Laura-Thanks-come back and see the results! So exciting! I absolutely adore this bed, Beth, and can't wait to see it in your bedroom. Averill--Wait until you see it in the room-it's gorgeous! Sarah-It's really gorgeous in person-glad you like it. You are SO LUCKY. I cannot wait to see the after pictures! SF-The Chinese Chippendale chair is drying and the room will be ready for its photo shoot. Wooow!!! I LOVE it!! Now we need some pictures!! I opened a blogger account, just so I could comment on your blog. LOVE it!! Post photos of your home. I have a feeling it very similar to my taste. Dagny-Pictures this week, I promise! kblutz-I think that's my favorite comment ever-thanks so much! I will show the bedroom this week and will start showing more of my home. Thanks!